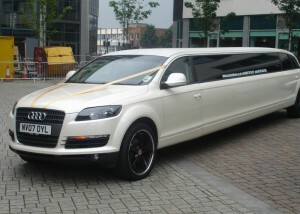 Audi Q7 Limo Hire is one of the most sort after Limos and Limo Hire Services available in the uk. Ace Star Limousine Hire have a stunning brand new Audi Q7 in stock for all types of Limo Hire Services. Our services include: school proms, graduations, hen do`s and stag do’s. If you looking for affordable Limo Hire then you have come to the right place, the Q7 is perfect to take you and your mates on a night out where you will be the talk of the town. We can also provide the Audi Q7 Limo Hire for special occasions such as weddings, birthdays, corporate events and sporting events. If you would like the Audi Q7 for an Indian Wedding, Muslim wedding, Sikh wedding, Punjabi wedding or English Wedding – please contact us for further information. All our limos come with Air Conditioning, Luxurious Leather Interior, 360º Privacy Glass, Fitted Seat Belts, Sat Nav and as expected a Polite and Professional Chaffeur Driver. BOOK THE AUDI Q7 TODAY!